First posted November 17, 2014. Just saying: If you thought I fell for that spin last week that went along the lines of “it’s against the law to take a picture of the Eiffel Tower at night” — well, no, I didn’t. Let’s first get things first here, first. Although the Eiffel Tower was built in 1889, placing it in the public domain by virtue of its age, the light show was added to the tower later and is subject to copyright laws. As such, it’s technically illegal to share pictures of the tower’s light show on Facebook, Instagram, Flickr, and other platforms, even if it’s your own, original photo. The same rules apply for other famous landmarks in Italy, Belgium, and France. The Atomium in Belgium, for example, is also protected under copyright. That is pretty consistent with what the folks over at the “Tour Eiffel” (as they call it in Canadian) say as well. But okay, that — the claim of right — was really not first things, then, right? First things was, if you read very closely, that the article above refers to places with names like “Italy, Belgium and France.” I don’t know what the law is in Italy, Belgium or France, or even how copyright in these faraway lands differs from regular American copyright. 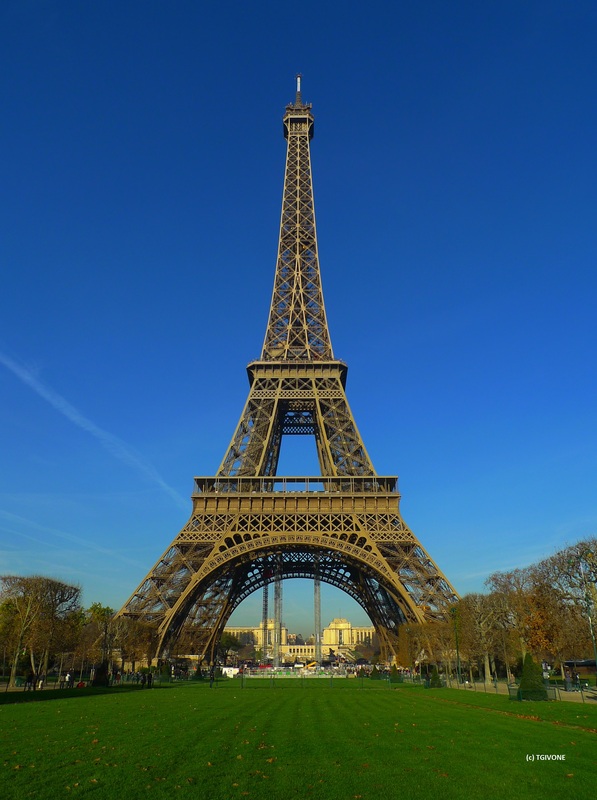 (Evidently, this Tour Eiffel is actually located in one of these foreign countries.) But based on how I’m seeing this story treated, it appears to be comparable enough to what we know about regular (American, that is) copyright that, being Americans, we can blow right past that and start poking around at this story. Is The Eiffel Tower Copyrighted? Well, here’s the latest in a series of bizarre stories about intellectual property concepts gone ridiculous. Apparently, the city of Paris retook possession of the Eiffel Tower in 2003 and decided that they’d had enough of its likeness being in the public domain. So, what do you do? You change the lighting on it, copyright the new light display and voila, all nighttime photos of the Eiffel Tower are now illegal without a license. This serves what beneficial purpose exactly? It’s hard to see how a photograph of a building that can be seen for miles around could be copyrighted in any way or what that could possibly serve any legitimate intellectual property purpose. It certainly sounds too bizarre to be true. And it pretty much is. But I am saving the punchline for a minute. First, a little primer on a topic that happens to be not quite as old as the so-called Tour Eiffel but is still a venerable LIKELIHOOD OF CONFUSION® favorite: Intellectual property claims in the public appearance of buildings, first discussed in the context of claims that Taiwanese skyscraper Taipei 101 is protected by trademark, later concerning the whole jumble of building “fame” rights that might be asserted in and around New York City, and, later, in the context of such claims surrounding Seattle’s Space Needle. What is it with insane NY-related bureaucrats and their attempts to “own” things? In the past, we’ve covered how New York State is a pretty big trademark bully over the “I ? NY” phrase, and did you know that the Metropolitan Transit Authority (MTA) claims ownership over the phrase “If you see something, say something”? And, now, we find out that the controversy-ridden Port Authority of NY and NJ appears to be claiming ownership of the NYC skyline. No joke. It apparently sent a cease-and-desist letter to Fishs Eddy, a housewares store in Manhattan that is selling some city themed dishes. According to the Port Authority, Fishs Eddy can’t do that, because, dammit, only the Port Authority owns some of those buildings and bridges. “Your use of the Port Authority’s assets on dinnerware and other items is of great concern to the Port Authority,” she wrote. Yes, and your use of stupid bullying tactics over people celebrating your city is of great concern to pretty much everyone else. What sort of life must you lead to spend your work life looking for people to bully for daring to sell merchandise that celebrates the city you technically work for? Ah yes… the entrepreneurial-as-ever Portal ‘Thority. But I digress. Anyway, yeah: No. No, you can’t restrict, in a non-commy’nist-country, the right of people to take pictures of public places in public spaces. This was even recognized to apply in the context of security concerns when, in 2010, the feds acknowledged that they could not prevent Muricans from taking pictures of the outside of federal courthouses seeing as how they are, after all, outside. The « Société d’Exploitation de la Tour Eiffel » (The Eiffel Tower operating company) deplores the unfunded rumor shared in the media concerning the monument’s lighting copyright policy. If it’s true that the illumination of the Eiffel Tower is protected by copyright, only professional or commercial use of these images is subject to prior request from the Société d’Exploitation de la tour Eiffel and may induce a fee. However, personal use of these images, shared by individuals on social media such as facebook, is entirely rights-free and doesn’t need any prior request from the Sociéte exploitation de la tour Eiffel. So, you see, the panic was all — all of it! — how you say?